The diagram below shows the structure of PAM and how its modules are related to one another. On the left-hand side of this page you can download a PDF for each module. We suggest that you download the documents in the order they are listed and by referring to the diagram. When writing the documents, we tried to strike the right balance between making them accessible whilst at the same time describing PAM in sufficient detail to show its innovative features and how they make PAM unique. Load Data. Reads in the asset register, asset maintenance and other data. Time to Failure Transformations. Prepares the data for the analysis and modelling modules. Asset Key Performance Indicators (KPIs). Calculates a range of KPIs as required. Asset Deterioration Curves (tactical level asset management optimisation). Produces a series of deterioration (risk) curves that show how the risk of asset failure changes for different values of a factor, for example manufacturer, as assets are used. Asset Survival Models Develops the survival model for each functional equipment class or similar asset classification variable. The models are the engine at the centre of PAM and are used in the Predicted Maintenance Interventions and Asset Survival Simulations modules. Predicted Maintenance Interventions (operational level asset management optimisation). Identifies assets at greatest risk of imminent failure so that they can have proactive maintenance to reduce their risks of failure. 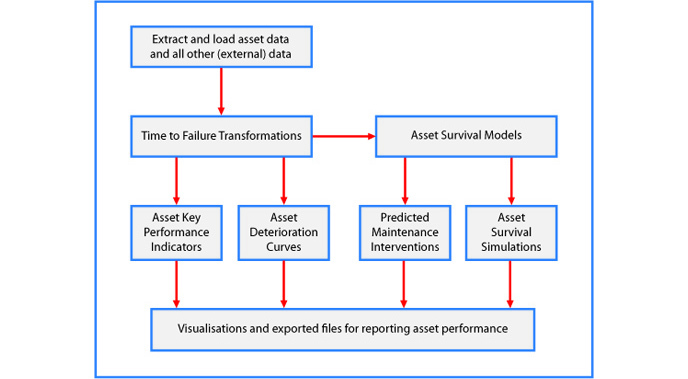 Asset Survival Simulations (strategic level asset management optimisation). Simulates the financial implications of a range of asset maintenance and replacement policies to determine the optimal, i.e. most cost-effective, policy subject to a range of constraints, for example the organisation’s maintenance capacity and attitude to the risk of asset failure. Asset Reporting Visualisations. Analyse graphically and in tables the results of each output module.